Fasting is certainly not a popular idea today. Just check out all the TV shows about food! Fasting has been a part of my prayer rhythm for 12 years. For nearly eight years I didn’t talk about fasting with anyone. I didn’t know how. I considered the subject too polarizing for folks. As I have had opportunities to share, I’ve been intrigued by how interested men and woman are with the subject. Here is what I’m learning in my discussions on fasting. We process lots of information today. Or try to process it, anyway. But most of it is shallow. We receive texts messages, read headline news, view TED talks and mini video clips. 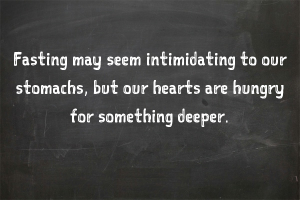 But what’s lacking is depth. 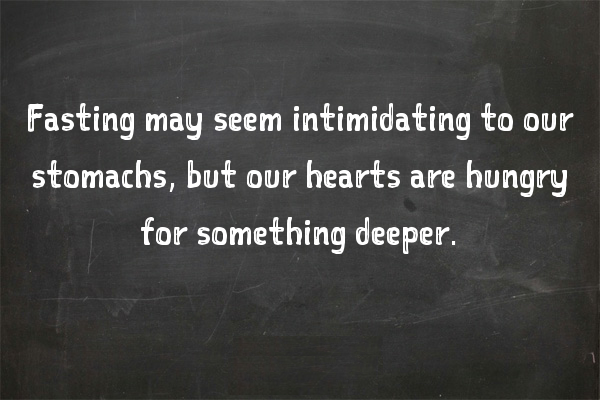 Fasting may seem intimidating to our stomachs, but our hearts are hungry for something deeper. People want to experience a different kind of “meat.” Going without food forces you to think, process, and ponder what really matters in life. Fasting brings mental focus and takes the mind off into the deep end… in a very good way. Life today is fast. Communication is instant. The need for decision-making is NOW! People welcome the opportunity to slow down. And fasting does that. Fasting quiets the noise, slows down the clock and suspends the pressure to be running at full speed. Taking the time to skip meals, slow things down, reflect and pray – is appealing to people. Food is a major force in our lives. If we’re not eating, we’re thinking about eating. And after a big meal we’re either thinking of how we ate too much, or where we’re going to eat next. Fasting puts you in control of food for once. Instead of your stomach telling you it’s lunch time, or the corner Starbucks pulling you in for a hot drink, or the vending machine calling you for an afternoon snack, fasting is your chance to deny the flesh for something better. People are tired of the same ‘ol thing. Another podcast sermon, another bible study, another service project, another conference. And people want different. They want something new. Fasting is not new of course. But for our food-obsessed culture, it’s a fresh idea. People are shocked to learn how easy it is. Fasting is not easy, it will test your stomach and your will… and your faith. But it’s way easier than people imagine. The body was made to fast. For those interested in an extended fast (7, 10, 20, 30 days or more), they’ll marvel at how the hunger system goes to sleep and the body can cruise by skipping meals day after day. The stomach reacts more favorably to eating nothing versus eating less (shocking, I know). Of course, fasting is not about losing weight. It’s about prayer. But in a culture where one third of adults are obese, fasting can be a wonderful tool to reset the body to more desirable weight levels while pursuing a spiritual journey with God. When the pharisees asked Jesus why His disciples didn’t fast, His answer was simple. Sure enough, after the resurrection the disciples did fast.